Delhi-based Roast Media Pvt. Ltd, which operates mobile entertainment app Roast, has raised an undisclosed amount in funding from Indian Angel Network (IAN). The funding was led by Sanjay Mehta who will also join the company’s board. The startup plans to use the funds for acquiring customers and investing in its technology platform, it said in a statement. 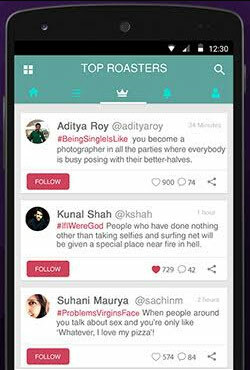 Roast is an entertainment mobile application that caters to users who love to converse and take a stand on anything. It allows them to connect with friends and strangers, speak their mind and watch events unfold in real time. The company was co-founded by Anchal Singh and Aamer Rushnaiwala. Both Singh and Rushnaiwala hold MBA from IILM Institute for Higher Education, Gurgaon. Before launching Roast, the duo started Mintified, an online media firm that collates and curates content. “We aim to be a premier micro-sharing entertainment platform on mobile, catering to the ‘entertainment in short’ need of witty Indians. IAN investors have not only mentored us but have helped us make the right decisions,” said Anchal Singh co-founder, Roast. In March 2016, Transcell Biologics Pvt. Ltd, a Hyderabad-based stem cell research firm, had raised an undisclosed amount of investment from IAN. Chennai-based robotics training startup SP Robotics Works Pvt. Ltd, Styledotme Fashion and Lifestyle Pvt Ltd, which operates mobile fashion app Styledotme, and Roadhouse Hostels Pvt. Ltd, which runs a chain of hostels targeted at backpackers, are among the other firms where IAN has invested this year.